The last couple weeks I’ve been too busy to participate in my favourite blogging phenomenon…what i ate wednesday! As usual, thanks to Jenn, the creative genius behind WIAW for hosting such a lovely little party to help get us all through the week. Make sure you visit PeasandCrayons for more WIAW fun! I mentioned that Mr. PG was away for a week, so let’s see how I did without the fancy chef around. Did I revert back to my single lady days of cereal for dinner? No…and that’s really only because I was too lazy to carry milk home from the store. Green monsters were a neccessity. Especially enjoyed on the patio. Delicious creation. 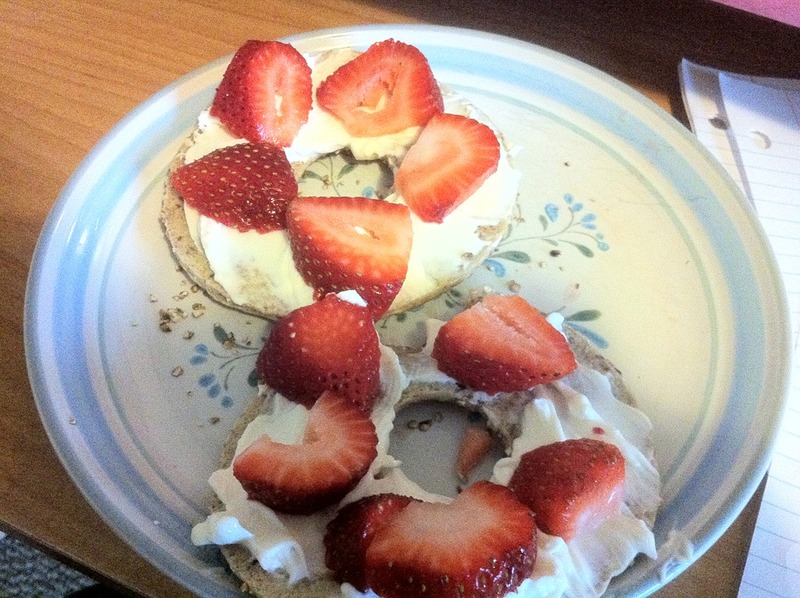 Light cream cheese on a toasted bagel thin with fresh strawberries! 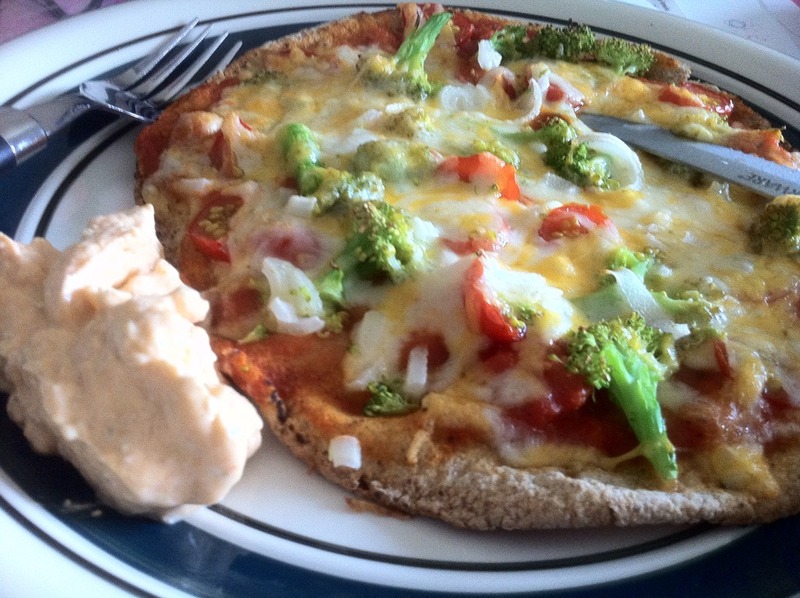 Veggie pizza on a pita. Served with some sweet sweet jalapeno greek yogurt dip for the crust. And obviously some dessert! 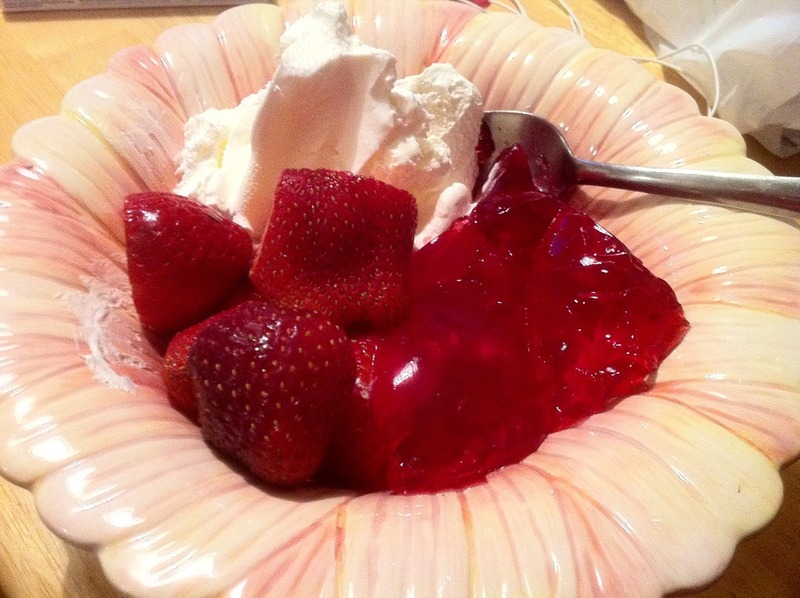 Jello, strawberries and cool whip! Moral of the story is make sure you read the instructions and ingredient list before you start. But also, if you screw up hopefully you will be so lucky to have a man friend come home from his trip early and somehow salvage your creation and make it delicious. Another thing I noticed, is I was a fake vegetarian while he was away. (I say fake because the second he came home he made us steak on the BBQ and I was all too excited). There are certain types of meat that I really don’t usually enjoy, but I eat because I know I need iron/protein etc…I also tend to enjoy meat less when I make it. So i tried to be extra conscious that even if I wasn’t eating meat I wouldn’t become malnourished as a result of being home alone for the week. I got most of my protein from nuts, greek yogurt, and eggs, and iron from oatmeal, spinach, pistachios and chick peas. I also read recently something along the lines of eating vegetarian for just one day a week reduces your carbon footprint equal to or more than buying all of your groceries locally grown . interesting…. ANY VEGGIE RECIPES TO SHARE? that pizza looks delicious! i love making vegetarian stuffed shells, with light ricotta cheese, and lots of chopped up veggies and spinach in the mixture. I have been eating a lot of meatless meals lately actually, and I really thought I’d be missing something…but surprisingly not at all! My fave veggie recipes as of late include quinoa. Usually some sort of quinoa bean stir fry…I’m obsessed with them! 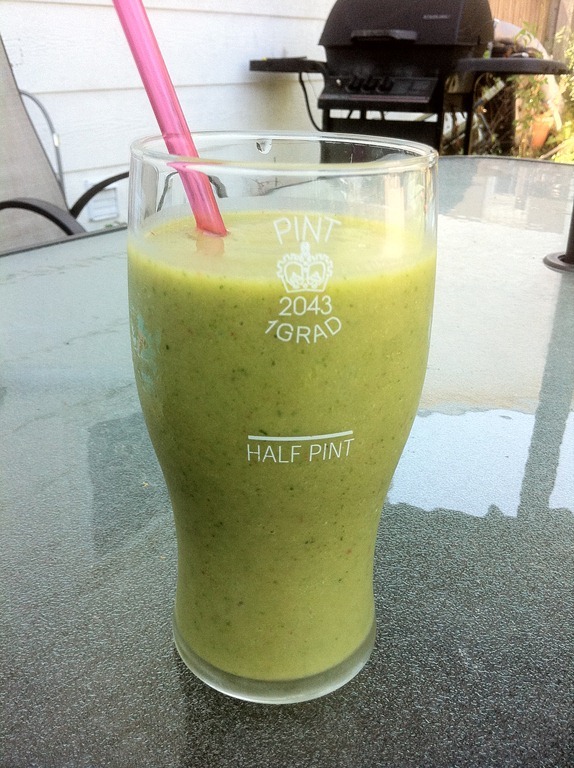 Perhaps it’s because I am relatively new to your blog, but what on earth is a Green Monster!? Looks incredibly nutritious! How about delicious? My husband and I went vegetarian for a few weeks just to try it out. It was easier than I thought it would be and we have decided to be semi-vegetarians, basically just limited out meat intake. It’s been fun to experiment with different proteins but honestly, I’ve found that I often don’t eat meat for days without even trying. 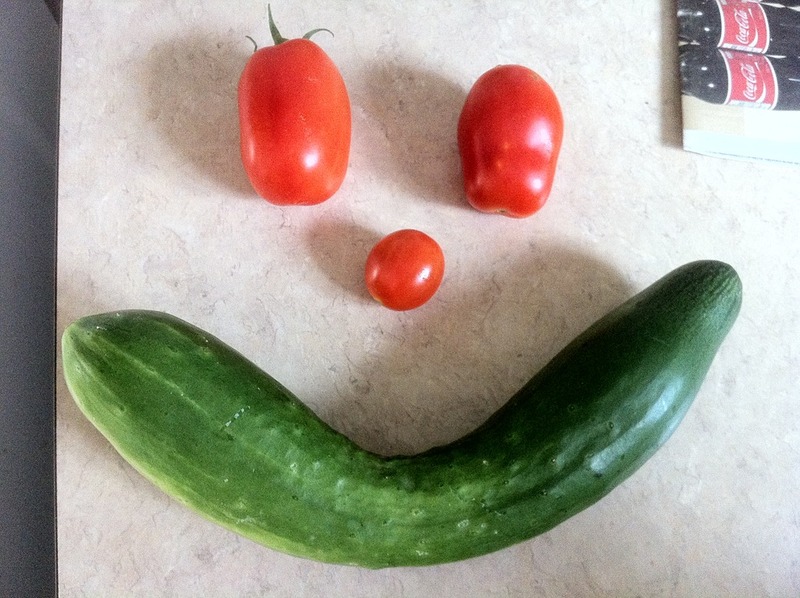 Love your smiling veggies, btw. Yum that pizza looks good! That’s really interesting about eating vegetarian for 1 day a week! I love meat too much to give it up though haha. If you’re looking for some good vegetarian recipes, I highly recommend Mama Pea’s cookbook…it’s fabulous! I’m dying over your bagel with cream cheese. I haven’t let myself buy them at the store since my bagel bender this summer. I love them so much, but when I have them at the house it’s ALL I will eat. It gives delivery a run for it’s money! All my recipes are vegetarian, and i just posted one on tempeh today! You are too cute with the cucumber face. Totally something I would do too 🙂 ha! Hope you are having a good week Meg!